Gerard Roofs are a top-quality tile solution for a new roof or re-roofing job. With a variety of profiles, textures and colour choices, there is an option to suit your house. When building a new home, Gerard Roofs are cost effective! Unlike older style tiled roofs made of concrete or terracotta, modern steel tiles are much lighter and therefore require less supporting structure, which reduces costs through less materials and labour during contruction. Maintenance is simpler with Gerard roof tiles. Gerard Roofs recommend cleaning every three to five years with a mild detergent. This prevents the growth of algae, moss and lichen, which can damage the surface coating. 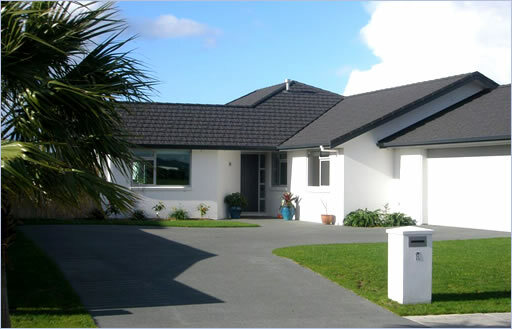 Colorsteel Roofs come in a range of natural colours designed to suit the New Zealand landscape. The Zincalume steel is coating with the Endura paint system, which provides protection against corrosion in areas where moderate to severe environmental conditions exist. John Duff Roofing installs Colorsteel in accordance with NZ Steel's recommendations and therefore, our customers get a 15 year durability warranty for roofs and wall claddings. However, in moderate, inland locations, a 30 year warranty that the prepainted steel will not flake, peel or excessivle fade applies.